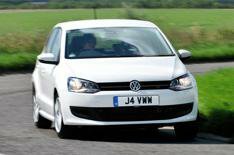 Volkswagen Polo range updates | What Car? Volkswagen Polo trims have been updated with a new R-line Style model added to the range. R-line Style is based on the entry-level S trim and adds the R-line bodykit, which includes a bespoke grille, 16-inch alloys, side skirts and different front and rear bumpers. It also adds Bluetooth as standard and is available with a 1.2-litre petrol engine producing either 59bhp or 69bhp. Average fuel economy is 51.4mpg for both units. Prices for R-line Style models start at 11,740 for the 59bhp 1.2-litre 3dr, rising to 13,235 for the 69bhp 1.2 5dr. Volkswagen dealers are offering a 1000 deposit contribution to those purchasing on PCP until the end of June. Bluemotion models now come with rear parking sensors, cruise control and an alarm. Match models have been renamed Match Edition and get the same equipment upgrades as Bluemotion versions. Both Bluemotion and Match Edition models cost 135 more than the versions they replace. SEL, R-line, Blue GT and GTI versions now get cruise control and rear parking sensors as standard with no price increase.